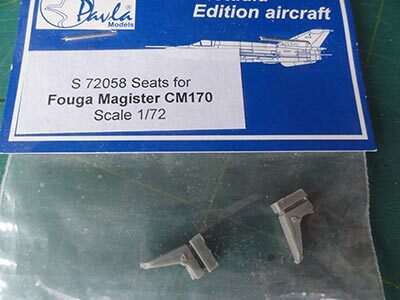 From France HELLER came with a nice 1/72 scale Fouga Magister in 1980. It also was released during the years in various boxes. 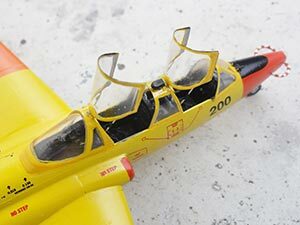 Heller kit #220 had decals for -1- French Patrouille de France aerobatic team and -2- West-German Luftwaffe. 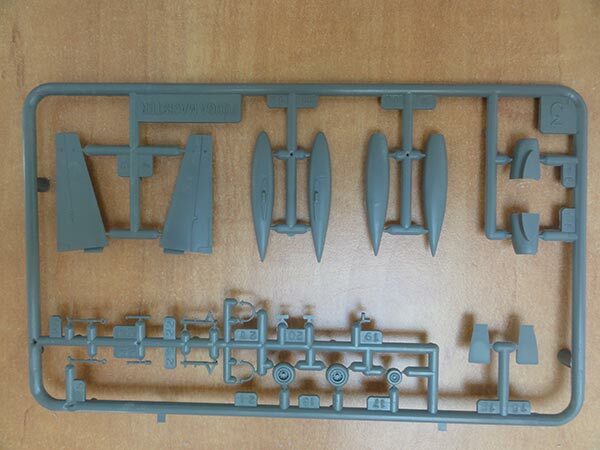 Release #80242 had instructions in German and a small set with Luftwaffe decals. 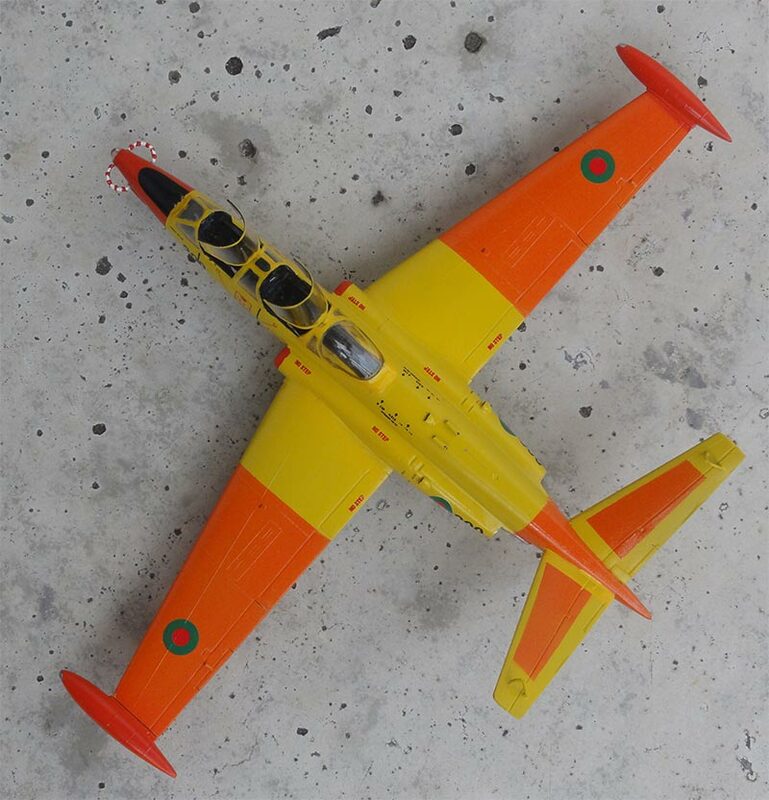 Heller Magister #80220 had decals for again -1- French Patrouille de France aerobatic team in 1978 and -2- West-German Luftwaffe based at Furstenfeldbruck in 1966. There are about 55 parts. 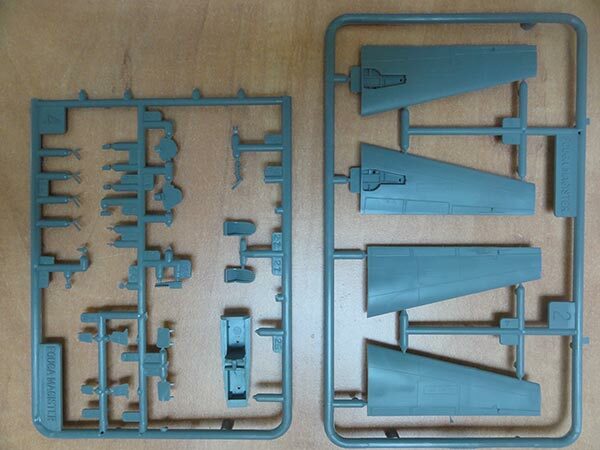 The plastic parts are a little finer than in the old Airfix kit. There is a nose wheel bay, the intakes look good and the small landing gear fine with details on the insides of the doors. The cockpit has separate seats. 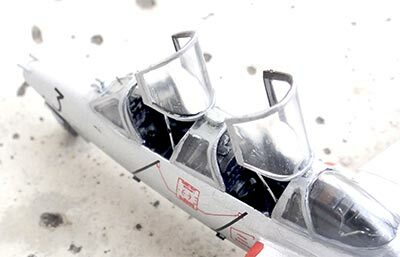 Both the small and larger wing tip tanks are provided to choose from with for (only) the large tip tanks nice tiny separate transparent anti-collision lights. The canopy has thinner plastic though still in one piece. Razor cutting is needed should you wish the canopies set open. Panel lines are raised but fine. Kit assembly is rather straight forward. At the cockpit side walls remove the plastic injection pips. There are no jet pipes so from a straw these were made and set inside the mid fuselage. The fit is pretty good with only some sanding and a little filler needed. I used nail polish remover to remove the putty to minimize sanding causing surface scratches. So I took care to keep the raised panel lines as much as possible (so decided not to remove and inscribe all these at these small scale models). The butterfly tail is best fitted after any sanding is done, any tiny gaps can be filled with white glue. 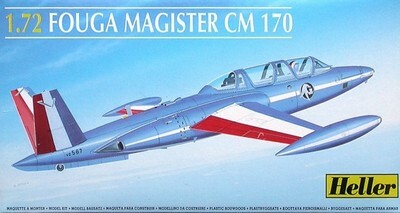 It is difficult to see on photos of real Magisters if the large or small wing tip fuel tank was used on a particular aircraft. 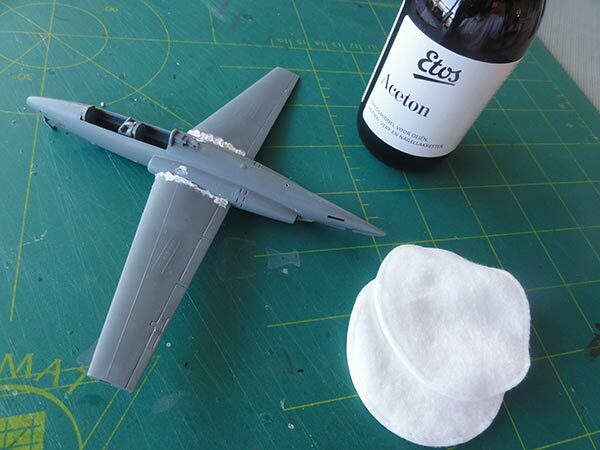 On all models, a base grey coat (using Revell aqua 75 "steingrau") was airbrushed before applying the colours to check for any small errors after sanding. Make corrections when necessary. 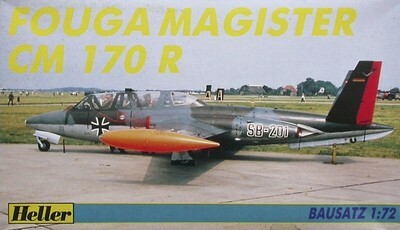 The first Heller Magister was made in a scheme of El Salvador. 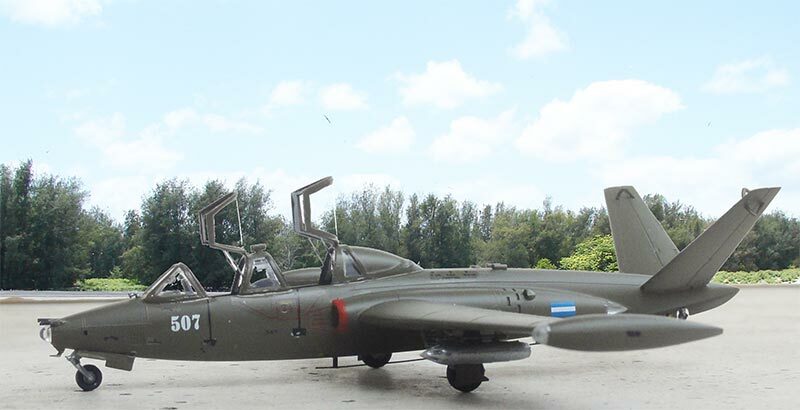 Nine former Israeli air force and three French Magisters were acquired by the Salvadoran Air Force and used as both trainers and ground attack aircraft in the Salvadoran Civil War. They flew alongside Ouragans and A-37 aircraft. The decals came from the MAX decalset #7223. 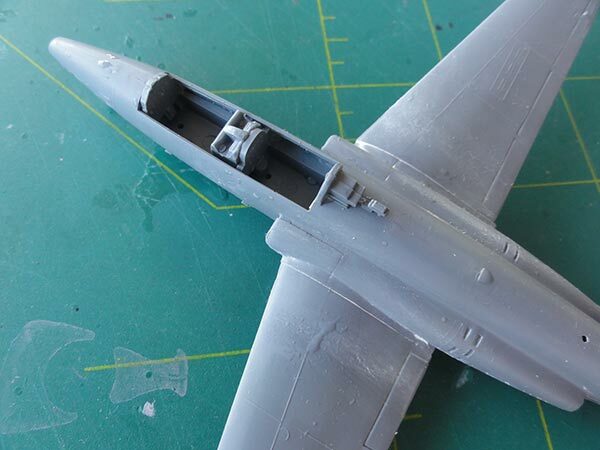 The small wing tip tanks were installed. I was not sure about the anti-collision lights. These were painted at the outside tips as metallic panels ("lights turned off"). The canopies were set open, so needed work with the fine razor saw. All the frames were painted and tiny detailing done from scrap. The edges of these part got a dark black edge from a permanent marker. This suggests they are thinner. 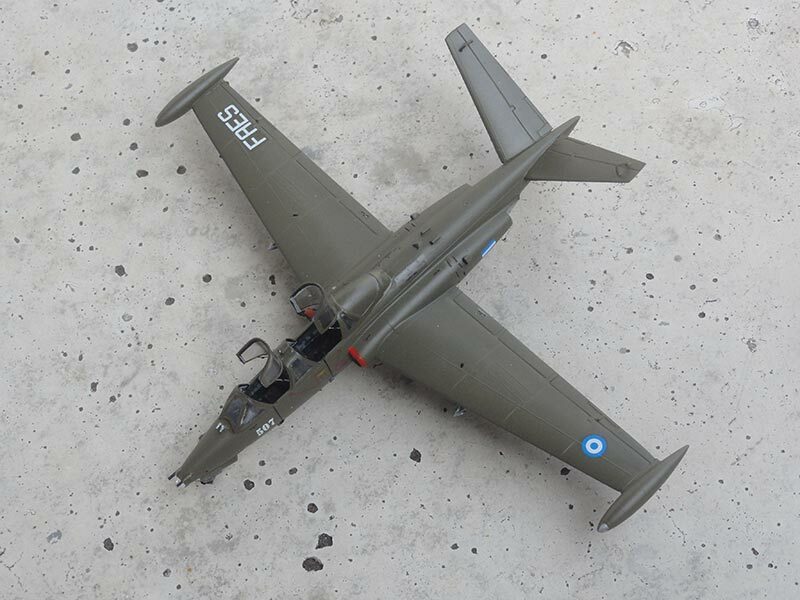 After decaling, the smaller bits were installed such as the landing gear, doors and antennas. Two 7.62mm machine gun barrels were set on the nose. No (what I think are) grip handles were set on the nose. Below the wing a few racks were installed and later on small gun pods. These were retrieved from the Special Hobby Magister kit. As usual, the model got a semi-dull varnish coat airbrushing Johnson Future / Pledge with some 5% mixed in Tamiya X-21 Flat Base. This gives an even semi-dull sheen and protects the decals. The canopies, fixation rods from tiny metal wire and the antennas were set in place and that completed this model. 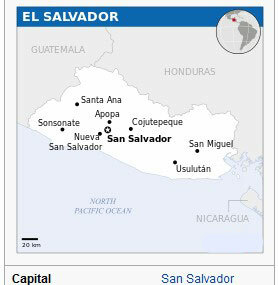 In El Salvador military service was set up in 1922 with the first aircraft being a French Deperdussin. In the 1920s followed a Curtiss Jenny trainer and Hanriots H320, Breguet 14 as well as some WACO aircraft. After the Second World War in 1947 the American "Rio" treaty was signed which provided mutual defense assistance among American states including the USA. Aircraft were T-6 Texans, BT-13, about 20 FG-1 Corsairs and some Dakota's. In 1969 there was a war with Honduras and from the 1970s internal conflicts in a civil war with Marxist guerilla's. 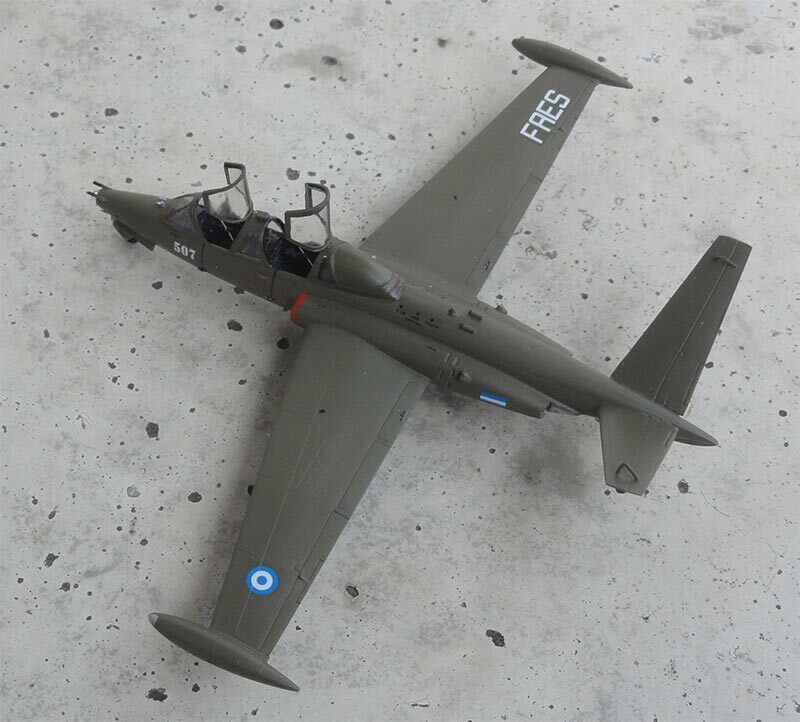 Acquired were 9 former Israeli and 3 French Magisters used as both trainers and ground attack aircraft as well from Israel 18 second hand Dassault Ouragans. The USA further strengthened the armed forces, some types being Cavalier F-51 Mustangs as well as UH-1 helicopters, Cessna O-2 and Hughes 500 light attack helicopters. Transports were also used such as C-123 Providers and C-47. 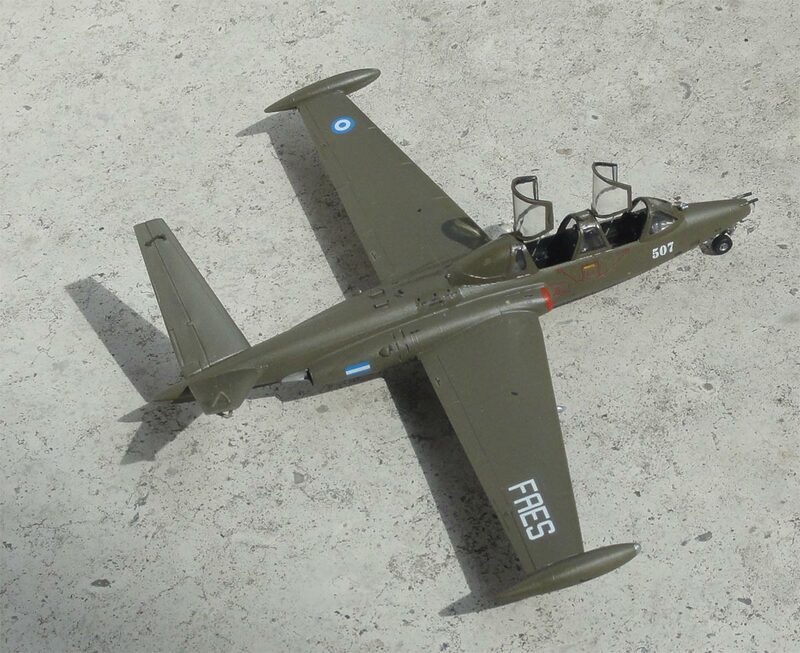 Some 8 Cessna A-37 attack aircraft were acquired from 1982. Current transports are Bell 407 and 412 helicopters and T-35 Pillan trainers. Main base is at Ilopango with another base at Comalapa and various smaller air strips are also used. 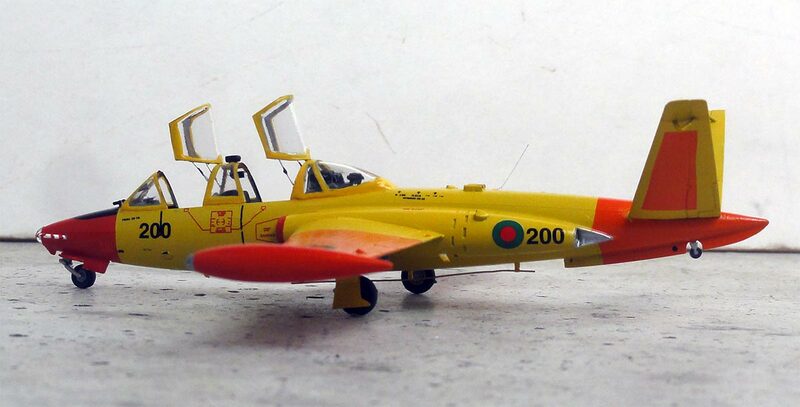 Another Heller Magister was as a Senegal aircraft. 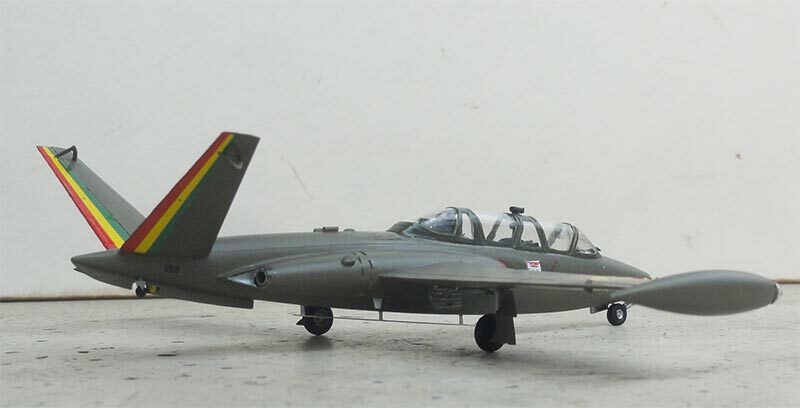 Five ex-Brazilian air force Magisters were acquired. The large wing tip tanks were used here. The decals came from the MAX decalset #7223 including the rudder flags. The colour is an overall dark green/ drab airbrushing Gunze Sangyo 309. The large wing tip tanks were used here. Install the rudder controls after the decals are set in place. The gear bays were painted interior yellow. It was decided to set the canopies closed as per kit. A periscope is seen on top of the mid frames. Also note the 2 small pitots in front of the wind screen. On the nose the grips were set in place and striped painted red-yellow. There is a long wire antenna below the fuselage, this was made from scrap. Note the white squares with emergency instructions below the canopy. This was established with small white decals cut and set in place before adding the kit decals. A final semi-dull varnish coat was airbrushed as described fro the El Salvador model above. 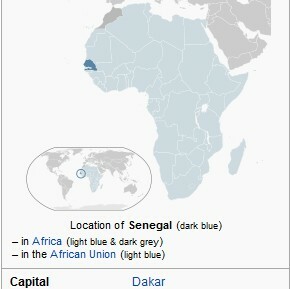 Senegal became independent in 1960 and a small air force set up with a few C-47 transports, Broussards and some Alouette II helicopters. From the 1970s 5 ex-Brazilian Magisters were acquired, being the first jets. A considerable transport fleet was set up with the first of six Fokker F27's arriving in 1977. From 1984 some 8 SOCATA Rallye aircraft followed which also could be armed as well as probably 2 additional Magisters from France and from 2000 another 2 Magisters. Also various helicopters were Puma's and Gazelle but also acquired were Mil types. Some Magisters flew until probably 2005. Spain donated 2 UH-1 helicopters and a CASA C.212 transports in 2008. 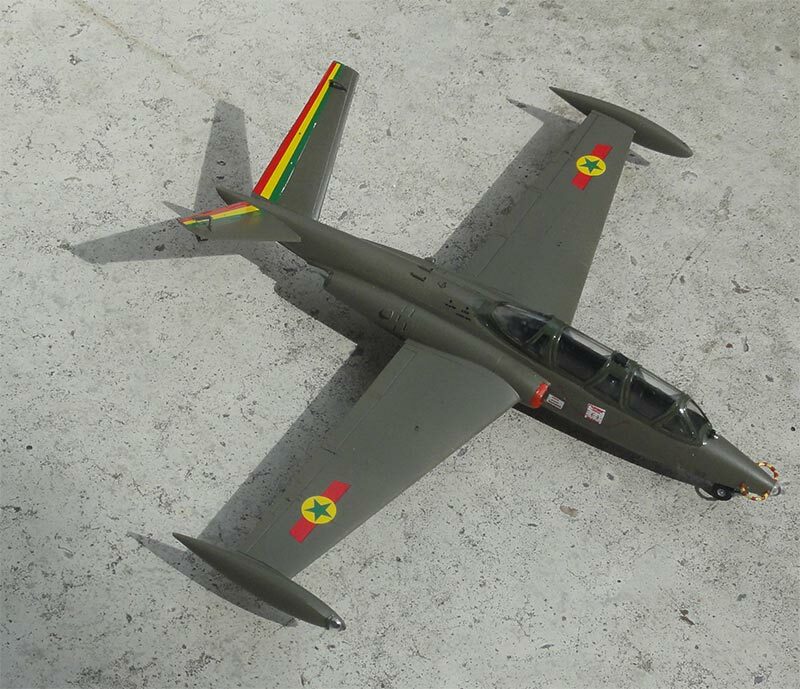 It appears 3 EMBRAER Super Tucano's were ordered in 2013. The main base is at Dakar international airport. 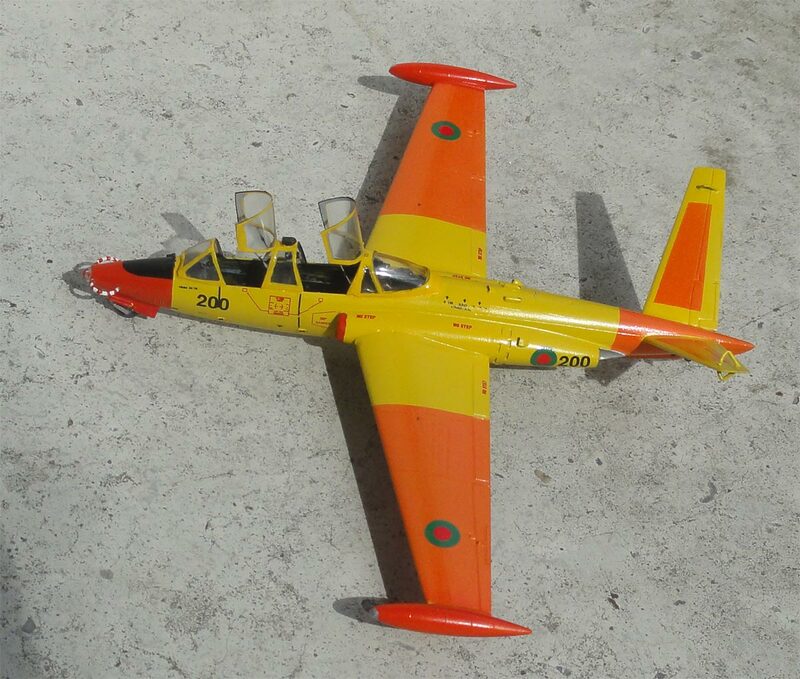 Another Heller Magister was made as an aircraft of the Bangladesh air force as seen in 1989. These were ex-West German Lufwaffe aircraft. The decals came from again the MAX decalset #7223 including the rudder flags. It appears the small wing tip tanks were used. The colour is first an overall yellow airbrushing Gunze Sangyo 329 acrylic. There are two shades of dayglow on these Magisters: on the nose Revell 330 red after masking as well as on the tip tanks. 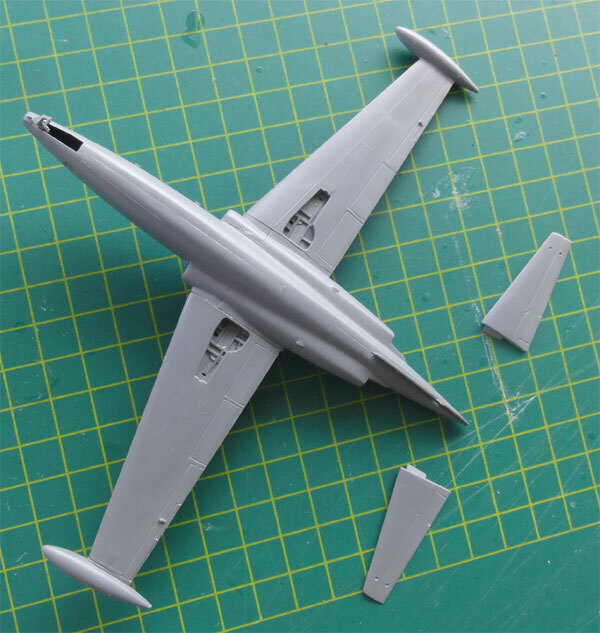 And at the wing areas and tail section Gunze Sangyo 14 orange. I had an aftermarket PAVLA vacu canopy. This was used but the canopies were to be set open, so some fine cutting with sharp scissor was needed. No mirrors are present inside these canopies but often a periscope is seen for the instructor at the mid frames. 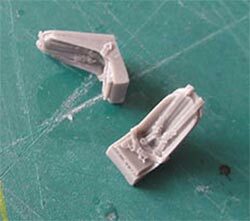 Also I used two resin seats from a PAVLA set S72058. But actually, the kit seat parts are OK when fitted with a few straps made from tape. The nose grips were set in place as well as 2 nose pitots in front of the wind shield. There is also long wire antenna below the fuselage, this was made from scrap. Also note the thin wire antenna on the spine, made from a piece of fishing line. As usual, the model got a gloss varnish coat airbrushing Johnson Future / Pledge. This gives an even sheen and protects the decals. The canopies, fixation rods from tiny metal wire were set in place. That completed the model. 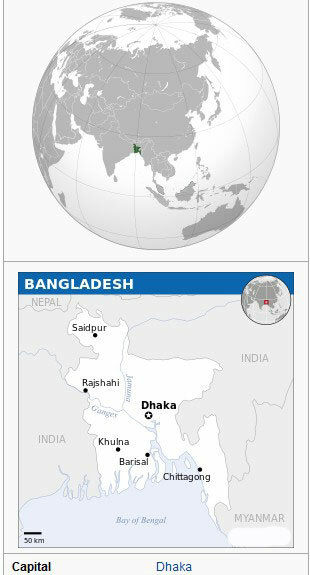 Bangladesh is a highly populated country in a delta and was first known as "East Pakistan". 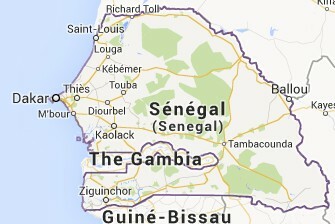 It became completely independent in 1971 after an independence war. 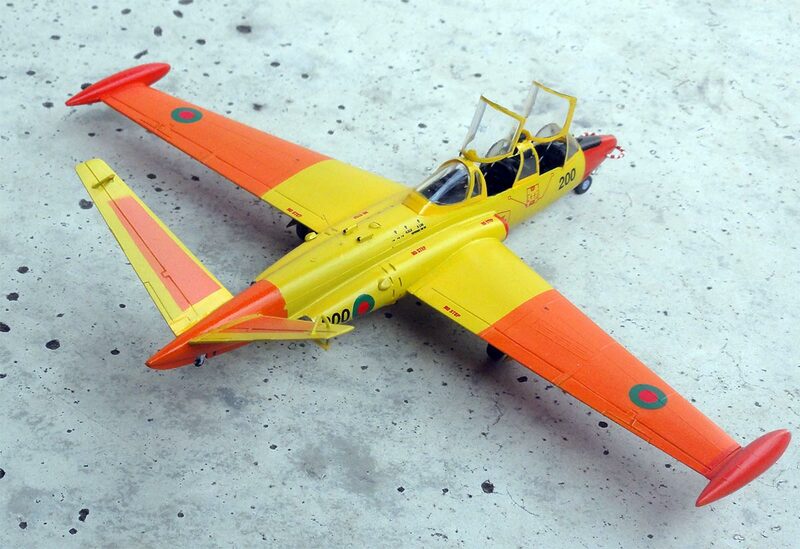 The Bangladesh air force "Bangladesh Biman Bahini" was soon established flying a DC-3, Twin Otter and Alouette III. It appears that even a few abandoned ex-Pakistan F-86F Sabres were used. The Soviet Union USSR donated some 10 MiG-21MF fighters and 2 MiG-21UM trainers as well as Antonov transports and Mil-8 helicopters. End 1980s the MiGs were replaced by the first Chinese "copy", the F-7. 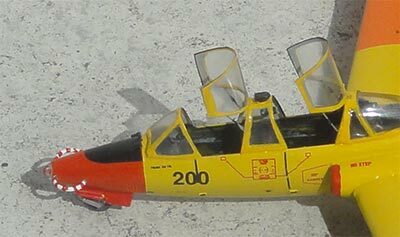 In the mid 1980s France delivered Magisters and the USA a dozen T-37 "tweeties". Pakistan supplied Shenyang F-6 aircraft as well. Some 8 MiG-29 "Fulcrums" were also delivered probably in 2000 and based at Dhaka-Kurmitola. Chinese A-5 attack aircraft are also probably operated as well as some 7 L-39 Albatros trainers. The Chengdu F-7 fighter fleet is regularly supplied with new Chinese ones like the F-7MG, F-7BGI with some 3 dozen aircraft in the fleet. (It appears some 8 Sukhoi SU-30SME advanced fighters have been ordered). Main bases are at Bashar (Dhaka-Kurmitola and Dhaka-Tejgaon), Matuir Rahman (Jessore), Zahurul Haque (Chittagong) and Bogra. The army operates a few types like the Pipers and Cessna's and the naval aviation wing flies types like 2 Dornier Do.228-212 and AW.109 helicopters. 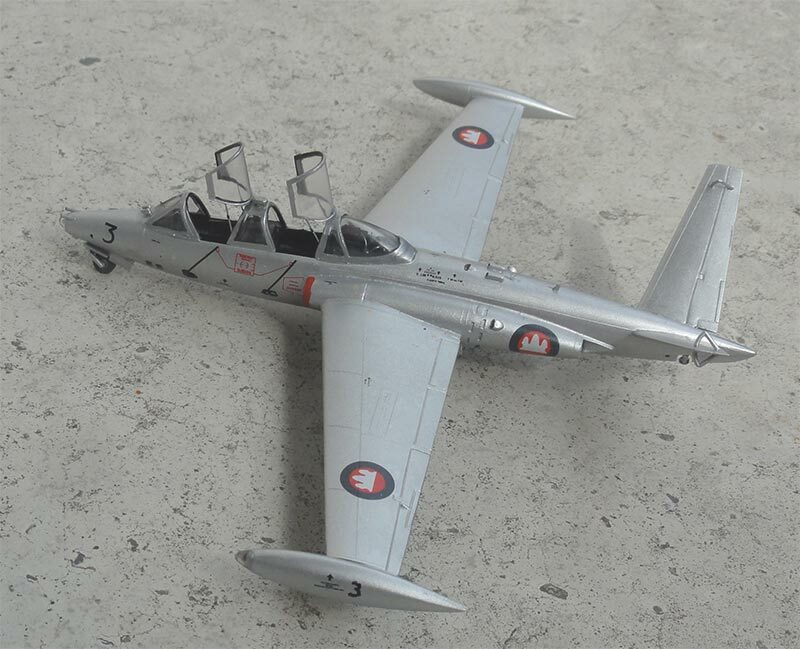 This Heller Magister model was finished as a Cambodja / Cambodia aircraft. This is a rather exotic user of the Magister. 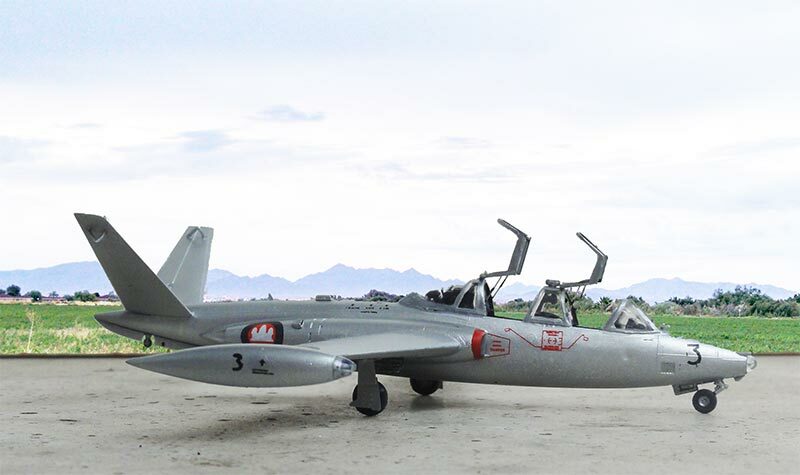 Cambodia operated four Fouga CM.170 Magister from 1961. This scheme is overal metal and I think these aircraft had the large wing tip tanks. The metal colour was airbrushed using Revell aqua aluminium 99, this gives a bit duller look. 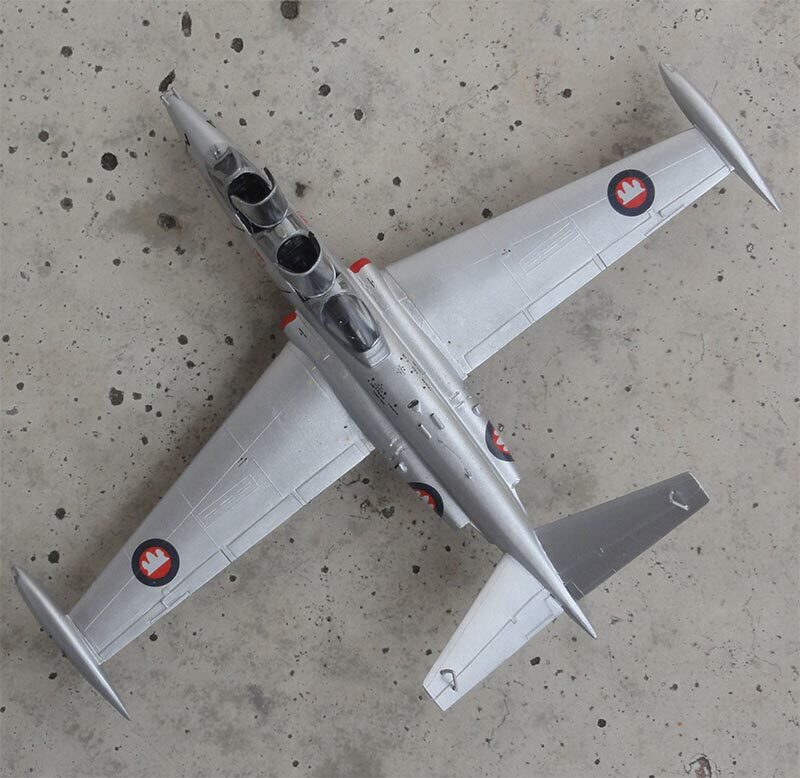 I retrieved the Cambodja roundels from a MiG-17 PrintScale decal set 72-008. 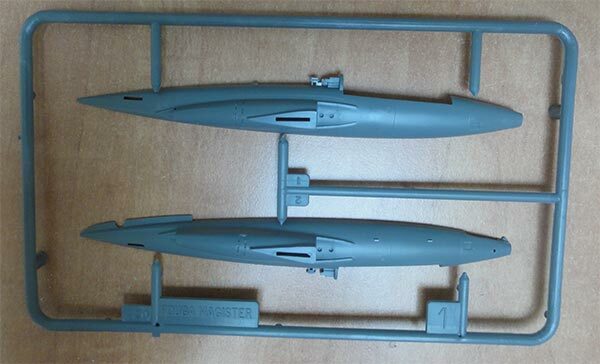 (option: Siam Scale has Magister decals available). There are a few black lines at the fuselage sides. The plane numbers came from the decal spare box. The canopies were to be set open. Work with the razor saw was thus needed on the single piece canopy. 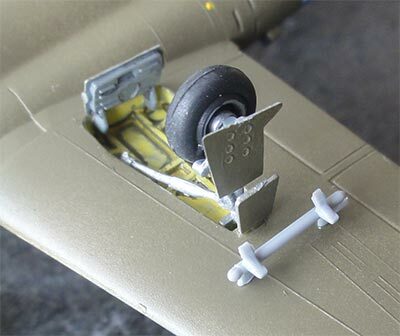 After decalling, the smaller bits were installed such as the landing gear, doors and antennas. 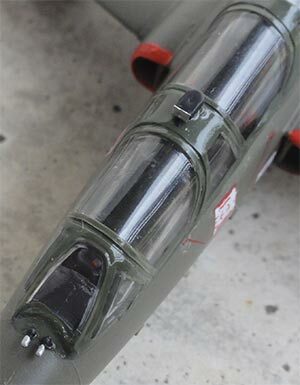 Two "7.62mm" machine gun barrels were set on the nose for the attack version made from plastic rod. Two smaller antennas were set below the fuselage. As usual, the model got a gloss varnish coat airbrushing Johnson Future / Pledge. This gives an even sheen and protects the decals. The cockpit got additional details. The edges of the thick clear canopy parts were "hidden" a bit by scribing a dark black edge with a permanent marker. The frames were painted aluminium. Canopies were set in place and that completed the mode. several roundels used during the various regimes. 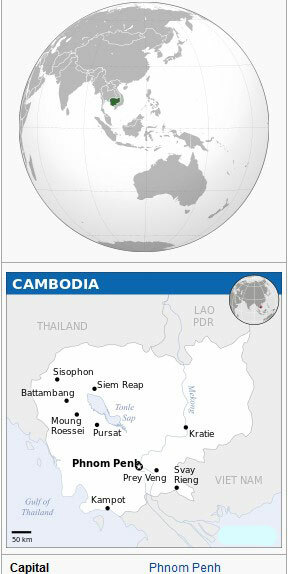 Cambodia also called Kampuchea became independent in 1953. It was a kingdom of the Sihanouks the previous centuries and in 1863 became part of a French protectorate. After the Second World War with French support an air force was established with Criquet aircraft, a DC-3 and MS.733 Alcyons. In the 1950s US aircraft were obtained like Cessna L-19 Bird Dogs, Texans and Beavers. 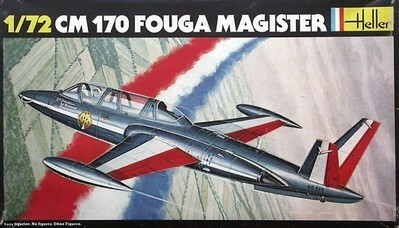 Alouette helicopters were acquired and 4 Fouga CM.170 Magister from September 1961. They were used initially only for training purposes, but were later also used as light strike aircraft. It appears that Cambodian Magisters were very active in the first weeks of Lon Nol's government. The USA supplied some 16 T-28 Trojans and 4 T-37B "tweeties" for training. A change in policy led to approach the Soviet Union for help in 1963. Several transports like IL-14, An-2 and a few Mil helicopters were supplied. End 1963 saw the first arrival of 3 MiG-17 fighters as well a MiG-15UTI trainer with additional MiGs supplied the following years and also Chinese military support. 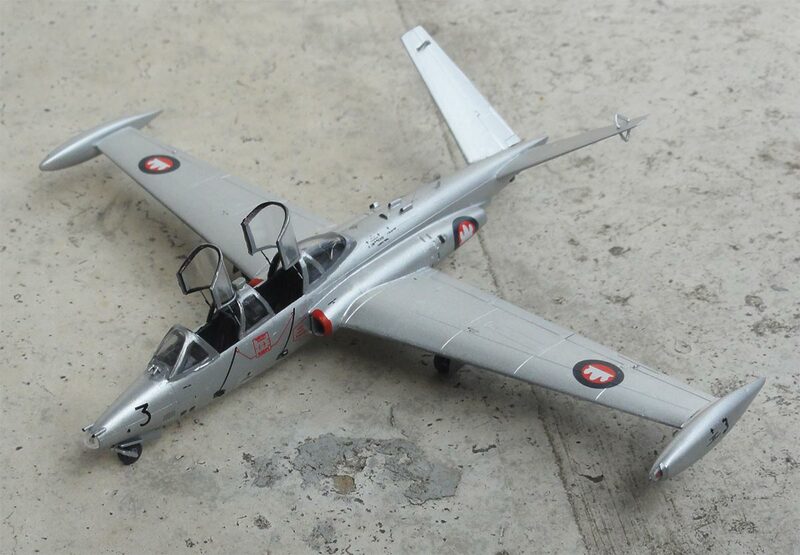 But also from the West French support came in the mid 1960s with Flamant transports and 4 second hand Douglas AD-1 Skyraiders attack aircraft. Regional tensions and the Vietnam war resulted in a military coup in 1970 and South Vietnam invaded with US support Cambodia. The Khmer Republic was established but the air force was in poor shape. Additional aircraft were supplied from the USA like C-47 and C-123 transports and dozens of UH-1 helicopters. Internally Communist guerilla's of the Kmer Rouge took over in 1975 and most aircraft were demolished and crews with their aircraft escaped to Thailand. The country was now called "Kampuchea" and China supplied the left regime with Shenyang F-6 fighters from 1977. The terrible regime of Pol Pot of the Kmer Rouge killed at least 1 million but probably over 2 million inhabitants of various ethnic groups with thousands of "killing fields". After a few years, in 1978 the now "one united" Communist country Vietnam (that kicked out the Americans in the Vietnam War), invaded Cambodia and overthrew the Khmer Rouge and established a new puppet regime in Phnom Penh. Still internal fights went on with counter insurgery ops from the USA and Thailand. Meanwhile, in 1986 22 second hand MiG-21 were acquired but these were only operational until 1992. Under international U.N. pressure, after general elections in 1993 King Norodom Sihanouk was back. The air force was now the "Royal Cambodian Air Force" and a new roundel was introduced. Some transport aircraft like Harbin Y-12 and Islanders were now operated and later on France also supplied helicopters. 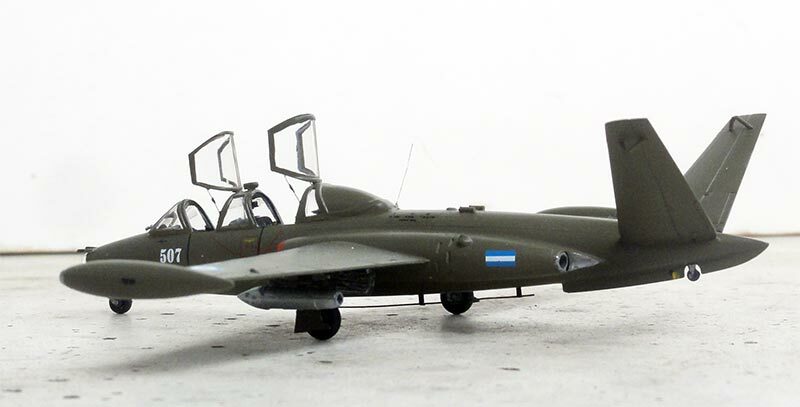 L-39 Albatros trainers were also acquired. It appears that IAI of Israel would overhaul the MiG-21 fleet but it is unclear what exactly was carried out. Probably only a few overhauled MiG-21's were made operational. Still as of today, China regularly supplies mainly transport aircraft and Z-9 helicopters. The main air force base is at Pochentong (Phnom Penh) but there are also various smaller bases. That completed a whole bunch of nice Magisters in exotic liveries. Still, the Special Hobby kits are awaiting!